While there were a few animated films released this year, most were made for TV or simply not very good – meaning we only have a single nominee who therefore becomes our winner. The Nine Lives Of Fritz The Cat is arguably better than the original, though most critics dismissed it as more of the same, or simply lacking the initial shock value or wit of the first one. Either way, both are an acquired taste. My Nominations: Robin Hood. Heavy Traffic. Charlotte’s Web. Fantastic Planet. This is actually a groundbreaking year for animated movies. Maybe groundbreaking isn’t the correct technical term, but it’s one of the first years to see more than one or two highly significant releases from different studios. Aside from the ones I’ve listed, there are other strong offerings from Asia and Japan, but I feel these are the best. 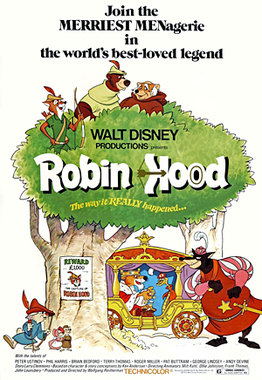 Robin Hood is yet another Disney entry, not one of their most popular or successful, but it does have a cult following and is one I was very familiar with growing up – lots of money moments and one piece of music in particular which will stay with you for days. Heavy Traffic continued Ralph Baski’s foray into adult animation becoming a fairly hefty success and containing his typical flair for raunch and satire. Charlotte’s Web is a film I never really liked, but it was always forced upon us in school.. I never got the whole ‘lets feel sorry for a spider’ business because ALL SPIDERS MUST DIE but it’s probably still the best adaptation we have. Finally, Fantastic Planet is an animation years ahead of its time, proving that the genre can be just as thought-provoking and powerful as any piece of non-animated work. Let us know in the comments which film you choose as winner! My Nominations: Fritz The Cat. Marco Polo Junior Versus The Red Dragon. Snoopy, Come Home. Tintin And The Lake Of Sharks. A decent year for Animated Features, with Australia making their first feature – mostly a flop but Marco Polo Junior Versus The Red Dragon remains a curio. Snoopy, Come Home was an unexpected flop – all the more so as it remains a good movie with all the humour and songs you expect. The only winner though is Fritz The Cat. Sure it’s a little cheap and rough, and it hasn’t aged particularly well, but it’s funny and it’s groundbreaking, reminding people that animation should not automatically mean for children only. Finally, another Tintin movie filled with the usual action and intrigue, but I’ve never been a fan of the series. My Winner: Fritz The Cat. Let us know what you think is the Best Animated Movie of 1972 in the comments! My Nominations: Animal Treasure Island. Daisy Town. Shinbone Alley. Bedknobs and Broomsticks was released in 1971, but it’s a live action movie with some animation. And it’s crap. So don’t complain if it isn’t here. That’s okay, because most of the nominations here are crap too and don’t really belong on the list. There wasn’t anything else though. Let us know in the comments what your favourite animated movie of 1971 is! In the seventies we were still so ‘early’ in the lifecycle of animated movies that Disney essential owned the market. As the decade progressed, Japan would see increased output of increasing quality and a few more companies would begin to emerge. MGM’s The Phantom Tollbooth has a 100% rating on Rotten Tomatoes but was not a success and MGM’s animation studio closed soon after. I prefer this to the similar (in style) Bedknobs and Broomsticks. 30,000 Miles Under The Sea is another early Toei Animation fantasy with plenty of action, but I think we all know what the winner here will be. The Aristocats is a minor Disney movie though fairly unique with its animal characters and musical approach. Let us know in the comments which animated feature of 1970 you would pick as winner! I was never a fan of Tintin – something about the hair, the way the characters moved, and the animation as a whole just made me uneasy. So Temple Of The Sun, you’re out. The Wonderful World Of Puss In Boots is one of Toei Animation’s most iconic films as Puss (or Pero) went on to become the company’s mascot. The film is a mixture of fast paced action and slapstick humour, the odd song, and bright animation – any fans of Japanese animation need to see it. My winner though is of course, A Boy Named Charlie Brown. While not as famous as his festive outing, this one still has the laconic charm and mixture of downbeat cynicism and offbeat humour as Charlie enters spelling bees to convince himself that he can be ‘a winner’. Let us know in the comments which Animated movie of 1969 gets your vote as the best! My Nominations: Asterix and Cleopatra. The Little Norse Prince. The SuperVIPs. Yellow Submarine. Asterix and Cleopatra is a surprisingly deep film with a lot of character and pot detail as well as some well drawn action sequences and musical numbers. The Super VIPs is a great little movie, well ahead of its time, charting the adventures of two superheroes – one a muscle bound freak, the other a stunted little man. It has a lot of humour which adults and kids alike will appreciate, making it look like a precursor to modern animated movies. Yellow Submarine is a bit of an illogical mess, but thanks to great artwork and (of course) music, it has a very unique style. The Little Norse Prince is one of the first Toei animated films I ever saw, pitting both Miyazaki and Takahata together and showcasing their flair for fast paced action, involving stories and characters, and fine animation which was beginning to move away from the Disney style to create a true, high quality competitor. Which animated movie of 1968 do you think deserves the win? Let us know in the comments! My Nominations: Asterix The Gaul. Mad Monster Party. Jack And The Witch. The Jungle Book. Even though there was no Animated Picture category this year, there are a number of notable films worthy of nomination. France’s most famous animated export Asterix makes his film debut. A decent film with all of the humourous traits of the comic even though I’ve never been much of a fan of the series. More interesting is Mad Monster Party, a films which deserves wider recognition and is perfect for younger viewers at Halloween. Even though the animation is dated, unsurprisingly, the script is strong, the songs are enjoyable, and the voice acting superb, from the likes of Boris Karloff and Phyllis Diller. Toei Animation’s Jack And The Witch is another great entry from Japan – a zany, dark tale of a strange car racing, animal befriending boy who has to take down an evil witch Queen who kidnaps and transforms children into monsters. My winner though, is yet another Disney feature, and one of my all time favourites. The Jungle Book is at once the archetypal Disney film, and one of the most unusual – we have beautiful animation, humour, poignancy, vibrant memorable characters, and wonderful songs. On the flip side, there isn’t a Princess or a love story in sight, the setting is unique (or at least it was for the time), and an ending which is not as obvious a ‘happy ending’ as we may be used to. With tonnes of hilarious moments which still make me chuckle – King Louis chumping over his own arms, Baloo deafening Baghera, the John, Paul, Ringo, George vultures etc etc. The last film Disney worked on himself before his death in 1966, it was also arguably the final great film from the company before their early 90s return to glory. Let me know in the comments what your favourite Animated Film of 1967 is! There were plenty of animated shorts this year as you would expect, and a few films blending animation and live action which I tend to not count here. The only true animated film from this year that I’ve seen is my default winner, and luckily it’s not too bad. I’ve never been a huge Flintstones fan, although I watched the show when I was younger even then it felt a little before my time. The film is a bit of a mish mash of ideas from the show while lampooning other movies and featuring the usual light-hearted satire on American values. There are a few decent songs and the animation is exactly a you remember it with that unique Hanna Barbera style. Have you seen this one? Did you watch The Flintstones when you were younger? Let us know in the comments! My Nominations: Gulliver’s Travels Beyond The Moon. Pinocchio In Outer Space. The Man From Button Willow. West And Soda. What is your favourite Animated film of 1965? Let us know in the comments section.